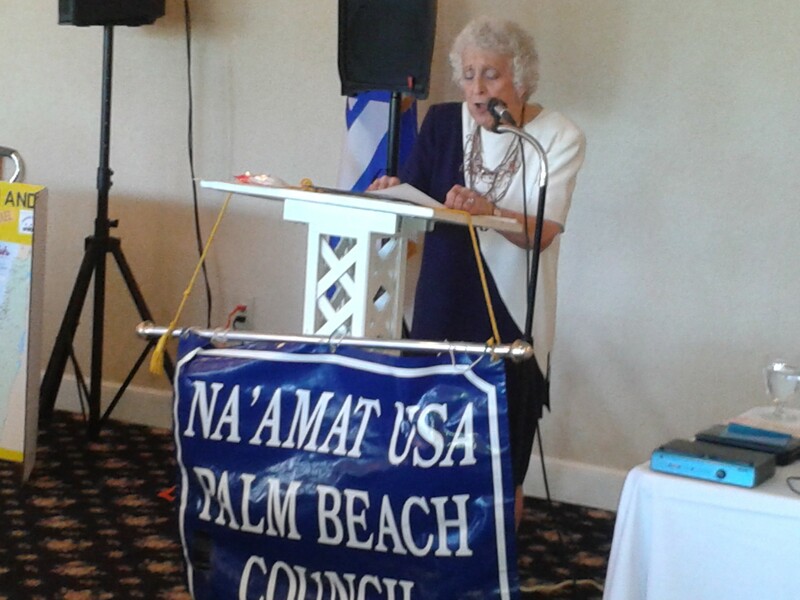 "WIN…for a Cause We Hold Dear"
Broward and Palm Beach councils of NA’AMAT USA held their annual Donor Luncheons May 3rd and 4th, respectively, to celebrate their members’ outstanding fundraising efforts in behalf of women, children and families in Israel. Donors were recognized for taking part in a wide range of activities that have provided critical funding for NA’AMAT daycare centers, professional scholarships, high schools for at-risk teens, women’s health and legal aid centers, and other social service programs. At the Broward Council event, held at King’s Point in Tamarac, three members were honored as “Women of Distinction.” Isabel Resnick has been a devoted member of the organization for 66 years, originally through its Brooklyn-based Sabra Club, where she served as president. Helen Lefkowitz joined NA’AMAT USA in 1967, when it was known as Pioneer Women, and has been co-president of the Masada/Natanya group for five years Bess Frumin, also a NA’AMAT USA member for more than 60 years, taught school in Detroit before retiring to south Florida. She has served as President of the Broward Council for over 20 years. All three women have been active in fundraising for the organization and in planning its many cultural and philanthropic activities. 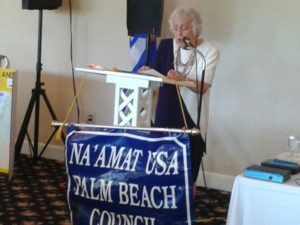 NA’AMAT USA National President Chellie Goldwater Wilensky attended both events and spoke to members about her recent trip to Israel where she witnessed NA’AMAT’s work first hand. She visited a recently renovated daycare center in Ashdod, a youth village for at-risk teens in Kanot and the site of a new women’s center in Sderot. Wilensky described NA’AMAT’s scholarship program which assists young women pursuing degrees in STEM subjects. She also talked about NA’AMAT’s latest fundraising programs, including Tech for Teens, and its WIN (Women In NA’AMAT) program, which aims to promote the organization’s impact in Israel and in the United States. Entertainment at the Broward Council event was provided by violinist Alexander Mikhalovsky, who performed a variety of Israeli, Hebrew and Yiddish music. Cantor Manny Gold entertained guests at the Palm Beach Council event.